In the highly competitive global vitamin ingredient market, most of the market share is held by top five players together. Those are Amway, Lonza, DuPont, Koninklijke, and BASF. Going forward too, these players are expected to hold on to their leading shares. Further the competition in the market is predicted to heat up in future owing to mergers and acquisitions and partnerships. A new report published by Transparency Market Research on the market for vitamin ingredients shows that it would rise at a steady 4.9% CAGR over the course of the forecast period starting from 2017 and ending in 2025. At this pace, the market which was valued at US$5.3 bn in 2016, will likely become worth US$8.1 bn by 2025-end. From a geographical standpoint, Asia Pacific is expected to rise at a steady 5.4% CAGR over the course of the forecast period owing to its burgeoning population, growing awareness about health among them, and a large number of people suffering from deficiency of vitamins. Others factors serving to promote the market in the region is the growing disposable incomes of people, strengthening healthcare systems, and a solid distribution network. 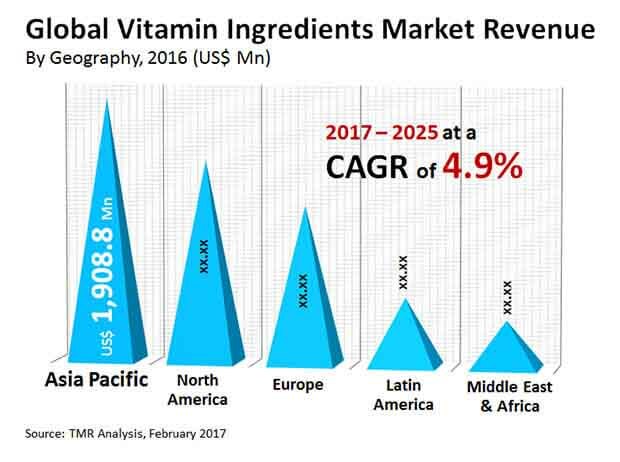 Despite steadily growing sales of vitamin ingredients, their market is yet to reach full potential because of the high demand for natural sources of vitamins such as fruits and vegetables, nuts, and fish. Further, increasing uptake of fish oil and other supplements and fortified foods is also dampening demand in the market. Notwithstanding such setbacks, the market for vitamin ingredients is predicted to soar over the next few years because of the entry of more number of private labels and the ecommerce boom. The latter is providing greater visibility to new products launched by brands who are also banking upon proper descriptions to educate the consumers. Besides, initiatives by governments for promoting intake of vitamins in children and pregnant women and the surging demand for cosmetics infused with vitamins has been catalyzing growth in the market too.